The annual Netroots Nation conference is a great opportunity for progressives from across the country to come together and strategize for the year ahead. The conference is an opportunity to learn about new tools for organizing and advocacy, connect with other progressive organizations and media-makers, and hear about the complex problems that progressives today are seeking to solve. This year’s Netroots Nation – held in Atlanta, GA, August 10-13 – comes at an especially critical moment in our nation’s history. Organizers and activists are fighting for the issues they care so deeply about, while being buffeted by a breakdown in institutions and rule of law. ReThink is proud to be presenting at 2 panels and conducting one training this year. Come join us for some insights on messaging to counter anti-Muslim bias, how to prepare for predictable emergencies, and creating traditional media moments from social media moments! Check out our panel and training descriptions below. Let’s face it, the first few months of Donald Trump’s America have been horrifying, but it can get worse. Moments of crisis, such as extremist violence or an international crisis, create windows for seizing power, enacting racist repression of entire communities, restricting civil liberties, cracking down on domestic opposition and going to war. Hitler used the Reichstag Fire; Putin used the 1999 apartment bombings; and George W. Bush used 9/11. With Trump, Bannon and their allies in Congress, progressives must be prepared to fight back in the first hours and days of a national security crisis. 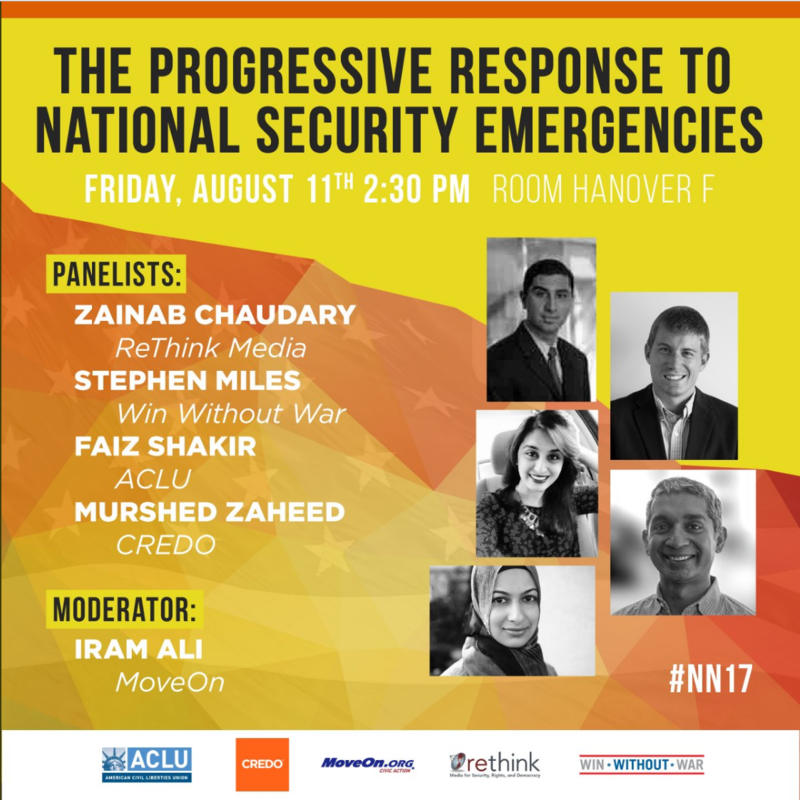 Hear from senior leaders from the ACLU, Proteus Fund, Win Without War and MoveOn. In an age where breaking through echo chambers and opinion bubbles is harder than ever, learn how to use proven message testing research to create relevant content for a variety of audiences. In this panel, we’ll touch on a recent round of message testing research around combatting bigotry against Muslims, Arabs and South Asians, and then puts the most effective messages to use. Hear from content creators who implement those messages with varied audiences and come away with both an understanding of the issues Muslims face and a sense of allyship. You’re at Netroots, so we already know you can put together killer social media campaigns. But before you bask in your digital glory, do you also leverage your social media success to get earned coverage in traditional media—turning your online moment into the breaking news story of the day? For every organizer or digital staffer who has ever had to convince your executive director, board, or funders why these social media moments have impact, this session is for you. Learn from the team that brought you campaigns like #CanYouHearUsNow, #MuslimsReportStuff, and #LetMIAVote, and your campaigns will be making headlines in no time. Attendees should know at least the basics of Facebook and Twitter to advocate for their issues, as well as some knowledge of how to measure if a campaign is successful. We’ll take it from there. Will you be at Netroots this year? Tweet to us @rethink_media and let us know!